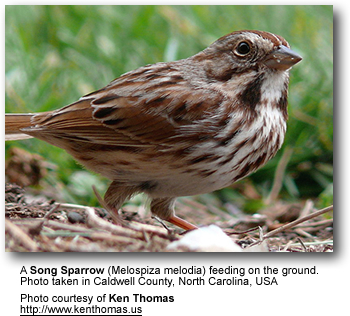 The Song Sparrows (Melospiza melodia) are medium-sized sparrows found in North America. 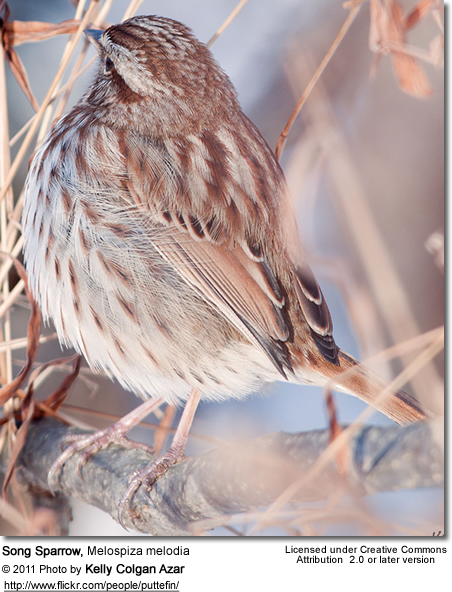 Within their large range, they may very well be one of the most abundant bird species. They were named for the male's melodious and fairly complex song - used to attract females and to declare ownership of territories. 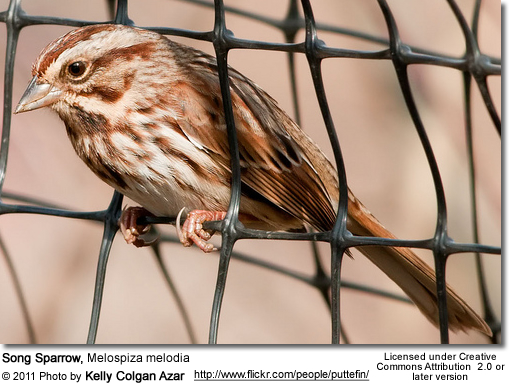 Song Sparrows occur naturally across most of Canada and the United States. Northern populations migrate south to southern United States or Mexico for the winter. Southern birds are often sedentary (non-migratory). Vagrants have been reported in Western Europe, Great Britain and Norway. Numerous subspecies have been identified that have been grouped by their ranges. Smaller with longer wings. Plumage brownish with strong black streaks. Range: Eastern half of North America except coastal areas south from New York State. Migrate southeast for the winter. ID: Very light plumage with black streaks below, and grey margins to the back feathers. ID: Resembles nominate form, except for grey back. Occurs west of nominate form to the Rocky Mountains. Northern birds may migrate to northwestern Mexico in winter. ID: Larger than nominate. Plumage duller. Bill more slender. Large, darker plumaged with dark streaks. Range: West Aleutian Islands (Attu to Atka Island), resident. ID: The largest subspecies. Grey plumage with long, diffuse streaks. Bill long and slender. Range: Aleutians from Seguam Island east to Stepovak Bay, Alaska, and islands to the south of Alaskan Peninsula. ID: Resemble ssp. maxima; but greyer plumage and more slender bill. ID: Medium-sized. Darkish grey plumage. . Range: Pacific coast of Kenai Peninsula and Prince William Sound islands. Both migratory and resident populations exist. ID: Smaller and browner than ssp. insignis. Range: Northern Gulf of Alaska coast. May migrate to Pacific Northwest in winter. ID: Small. Plumage is very dark and rufous-colored. Range: Southwestern Oregon west of Cascade Mountains south to northwestern California. ID: Upper plumage dark. Mantle edged brown with grey. Range: Sonoran and parts of Mojave Deserts to eastern Arizona. ID: Bold black pattern on belly and back, clear white throat. 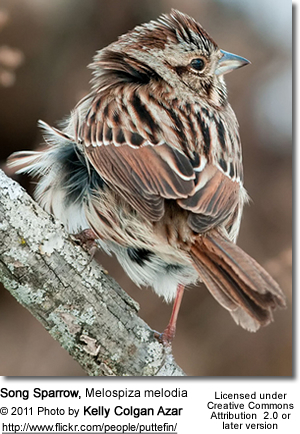 Lincoln's Sparrows: Shorter, grey-colored tail. Head pattern different. Their diet mostly consist of insects and seeds. Populations living in salt marshes may also take small crustaceans. They also visit platform feeders in search of millet and sunflower seeds. 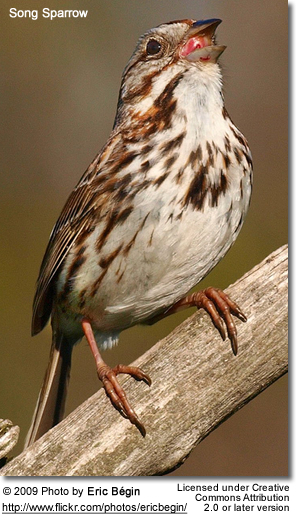 They nest either in sheltered locations on the ground or in trees or shrubs.